Towards the end of last term at John Perryn School, an extraordinary impromptu concert took place. Well-respected jazz musician Keith Waithe along with two other performers from his Essequibo Music group (Darryl Lee Que and Jo Jo Yates) performed alongside forty-two 7-8 year-olds in front of a packed audience of children aged 5-11. Two Year 3 classes had been rehearsing quite intensively every week and this was the grand finale. Keith, Jo Jo and Darryl were calm in front of their impatient audience. Some of the children found it hard to contain their excitement, but Head Teacher Von Smith and her team managed somehow to keep everyone sitting down. Keith and his team had been invited by Von Smith to run a series of workshops on creative music focussing on percussion. 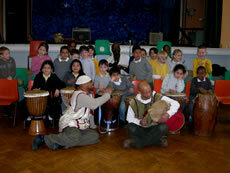 This was a collaboration between Essequibo Music and Year 3 pupils. In getting the children to perform, Keith was determined that they should enjoy themselves as well as developing their confidence, social skills and talent. I was allowed to watch the final workshop session. Keith, Darryl and Jo Jo were faced with forty-two excited children who looked as though they would do anything rather than sit still. It was amazing to watch them as the performances came together. Each class produced a vibrant, joyous sound. They started off chanting "chay chay coolay" - then graduated to the drums. "That makes them focus more," Keith told me. The music used was inspired by West Africa and the rhythm and chants came from Ghana (Jo Jo is Ghanaian) and the Caribbean where Darryl comes from. Soon the walls of the Hall at John Perryn were reverberating with the rhythm. 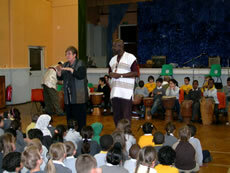 The children showed a range of different drumming abilities. Some stuck with the beat, others seemed to improvise. A girl with hearing problems started tentatively but her confidence grew as the session went on. The huge smile on her face spoke for itself. Amy Troughton, one of the class teachers, told me: "The class really look forward to [the jazz sessions] on Thursdays. There has been a huge improvement in their rhythm and they really enjoy it." Penny Humphries the Special Needs Coordinator, Sean Lawson - another class teacher and Carol Kay a teaching assistant were all watching the children and making sure the ones watching stayed in their seats. After a break which allowed the children to let off some steam in the playground, the entire school filed into the hall. The two groups of Year 3 children excelled themselves and everyone joined in at the end chanting: "Aya Moo Moo Deh!" Keith, Darryl and Jo Jo then performed some music themselves which was lively and very enjoyable. Keith is hoping to return to the school soon for more jazz sessions, this time with Year 5. Currently, these sessions represent the only extra music available for pupils - in addition to the music lessons which are part of the national curriculum. Music lessons like these are enormously beneficial for children of this age. They can help with concentration, coordination and confidence as well as nurturing skills in any musical geniuses. It was obvious that the children found the experience inspiring, and that they loved performing together as a group with Keith, Jo Jo and Darryl.